The engine, serial number 16-5/56, was purchased new by the previous owner from an importer in Sydney. 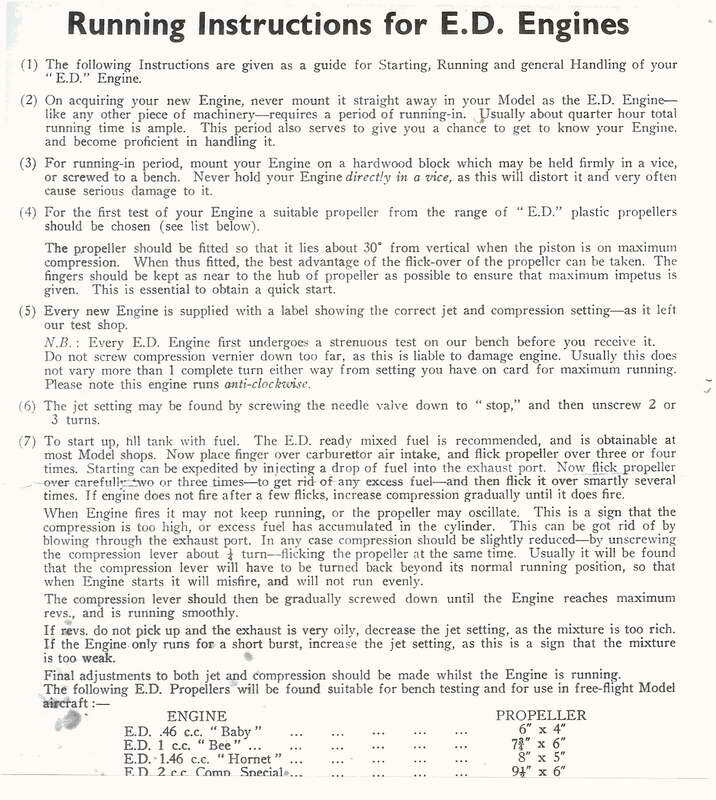 The purchase price appears faintly in pencil on the plain, brown box, and appears to be �/0/0, which made it a very expensive engine for Australia of the mid-50s. It came set-up as a glow, complete with a large brass-topped KLG Mini-glow plug. In later years, the owner fitted an Enya throttle assembly and the engine has been flown in an R/C model in this configuration. No alteration from original was made and I was able to remove the throttle and re-mount the original venturi and nva. 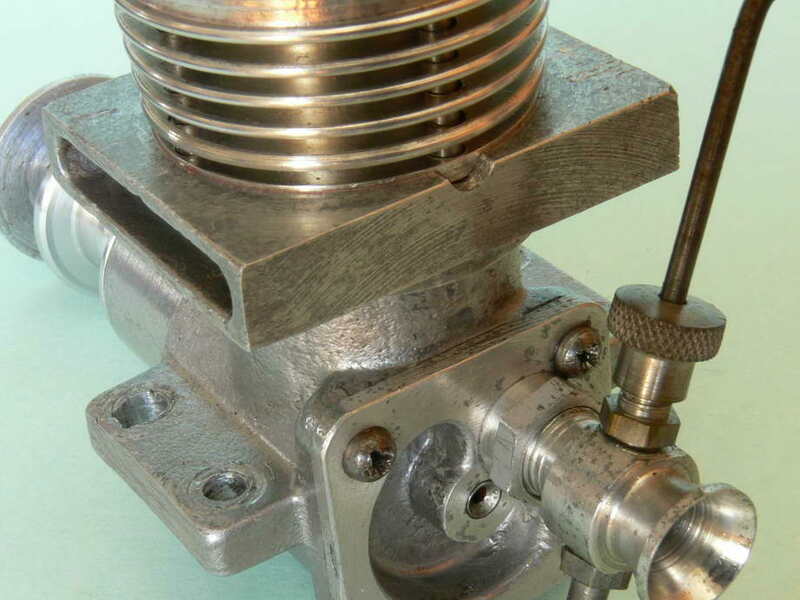 The standard Miles needle valve assembly (NVA) is a beautiful piece of work, having a knurled gland-nut which is adjusted to provide exactly the tension desired to restrain the needle. The attached image of the rear of the engine also shows the recess filed into the casting. This is necessary to allow the removal of the floating wrist-pin. 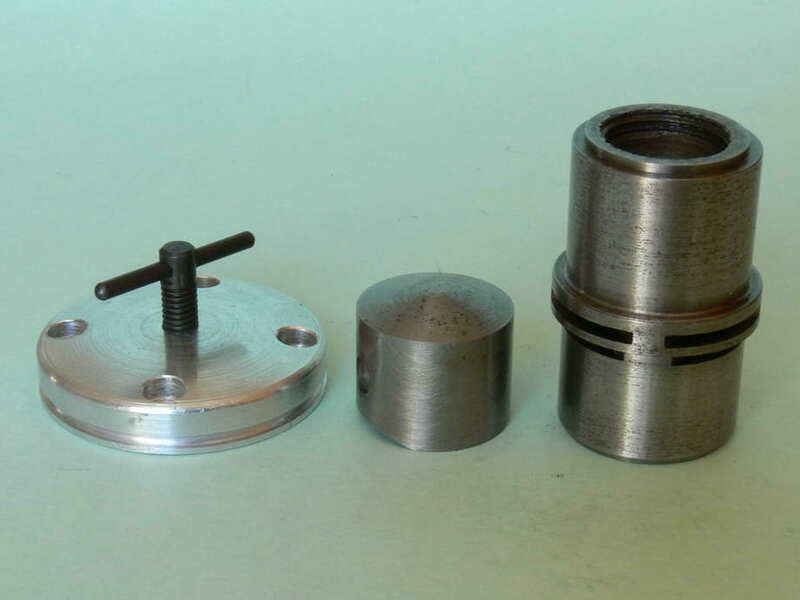 The diesel parts included at the time of purchase comprise a diesel piston/ cylinder assembly and a normal diesel head with compscrew, which would replace the glow head. These parts have never been fitted to the engine. 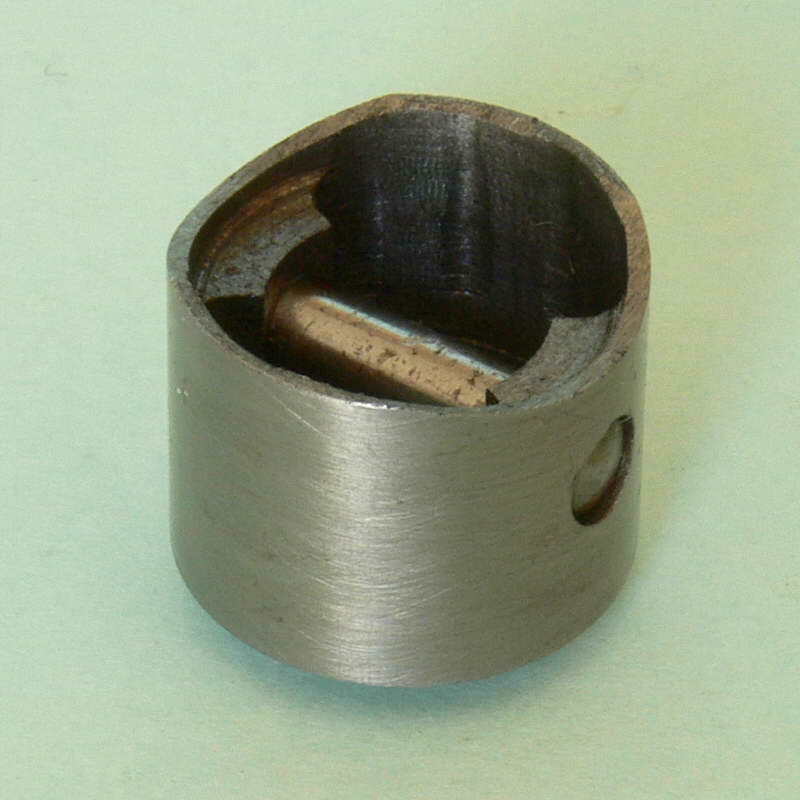 The cylinder itself is virtually a scaled-up E.D. Racer type, with slit exhaust ports over identical transfers. and stresses the correct alignment of the cylinder bars (with the screws). The designer and builder, Basil Miles, has gone to considerable effort to lighten the piston, by milling away all excess material around the piston bosses. It is hard to see how further lightening would be practical. The piston has a conical crown matching the contra piston and crescent clearance for and aft over the crank-disc and rotary valve. All other parts are completed to a very high standard and the engine has a very smooth feel about it, with superb sealing in both the cylinder and crankcase. 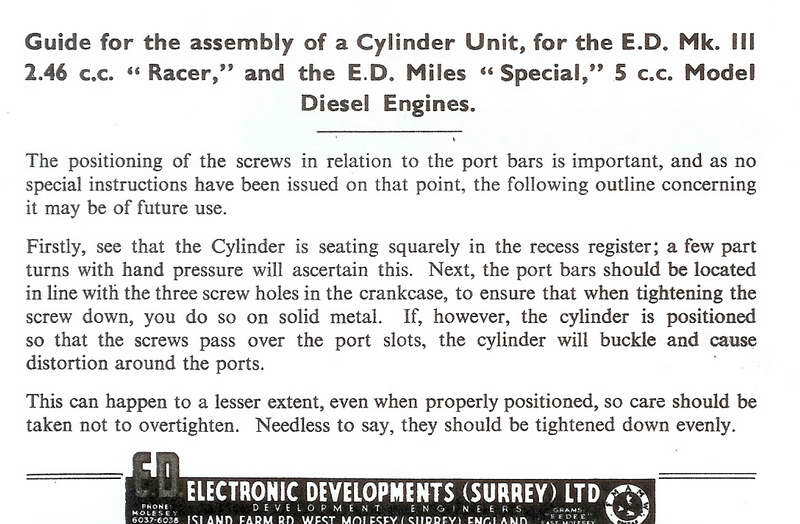 In a conversation with Basil Miles in 1989, he told me that the prototype Mk1 5cc diesel was presented to the E.D. board as a possible contender for production. E.D. were perturbed that this 5cc engine would contradict advertising on their very successful E.D. Mk IV Hunter 3.46 diesel, which was claimed to "be the equal of any 5cc diesel on the market", so they told Miles they were not interested in the design. When he went ahead and started to produce the engine himself in small quantities, it found a ready market. At this time, Basil Miles was a design consultant to E.D. and was told in no uncertain terms that all production of the 5cc diesel would now have to be sold through them, though he was free to sell his other specialist engines, ranging from 3.5cc to over 30cc. Some parts were now made by E.D., but finishing and assembly were done by Miles in his home workshop, all completed units being delivered to E.D. for sale. I have a special attachment to engines designed by Basil Miles, my first new engine being a 2nd model E.D. Racer purchased by my parents in 1955 for �17/0 from Ford's Sports Store in Wollongong. I still have the engine, though it was roughly 'Buskellised' by me at a later date.